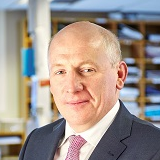 David Walsh was appointed Managing Principal on 1st May 2014 having joined the partnership in 2000. David previously worked with Coopers & Lybrand (now PwC) as senior manager and established his own firm in 1995 which he subsequently merged with O’Neill Foley. In addition to being a Fellow of the Institute of Chartered Accountants, he also has a Diploma in Business Administration from Manchester Business School, a diploma in Forensic Accounting from the Institute of Chartered Accountants and a diploma in Personal Insolvency. David is also the firm’s partner in charge of Business Restructuring and Insolvency Division. David advises both companies and financial institutions/creditors dealing with restructurings, Examinerships, Receiverships and Liquidations. David and his team provide audit services to a number of the firm’s clients across many sectors including agri-business, manufacturing, leisure and healthcare.